I cut my hub collection down to this. My NOS collection. Has to be new(Or exceptionally rare) to get included. Took another pic, as there was bits I hadn't had sitting there. Just a last......ish piece in the form of the 2nd generation black cable caliper, that bridged the gap between the silver one, that looked like the local blacksmith beat it out on the anvil, and the C2 No2 hydraulic caliper. Thanks to a member for helping me to empty paypal and that black caliper is now hopefully winging its way across the pond. I honestly didnt think id find one, let alone nos. Last edited by dyna-ti on Thu Jan 31, 2019 11:01 pm, edited 1 time in total. I do have some rears to match some of the fronts in the pics, but they are still built up. Some of the hubs are from broken or worn wheels or mismatched pairs. That's a well founded collection you have going on there. 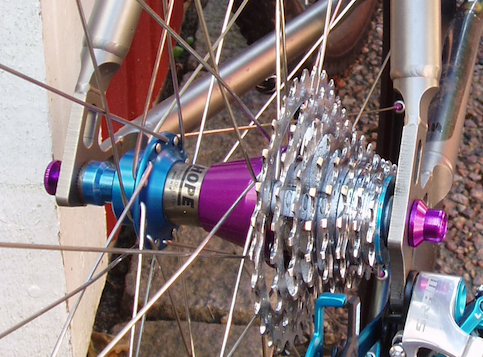 Incidentally, I've a spare lockring for that silver suspension you have there. I was going to pop it on ebay this week but if you still need it, drop me a pm.